The Kingdom of Cappadocia was a Hellenistic-era Iranian kingdom centered in the historical region of Cappadocia in Asia Minor (present-day Turkey). 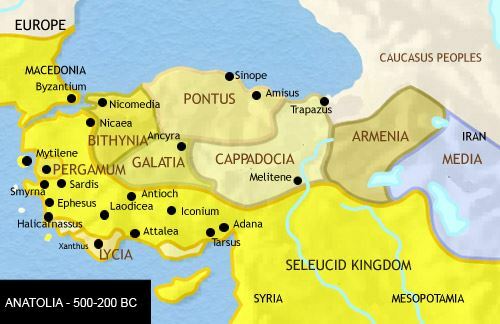 It developed from the satrapy of Cappadocia, and it was founded by its last satrap, Ariarathes I. Throughout its history, it was ruled by three families in succession; the House of Ariarathes (331-96 BC), the House of Ariobarzanes (96 BC-36 BC), and lastly that of Archelaus (36 BC-17 AD). In 17 AD, following the death of Archelaus, during the reign of Roman emperor Tiberius (14-37), the kingdom was incorporated as a Roman province. (10) Ariobarzanes II 56 BC ? Reverse: Athena holding spear and Nike, shield at her feet; BAΣIΛEΩΣ / APIOBAPZANO[Y] / ΦIΛOPATOP, Z? Reverse: ΒΑΣΙΛΕΩΣ ΑΡΙΟΒΑΡΖΑΝΟΥ ΕΥΣΕΒΟΥΣ ΚΑΙ ΦΙΛΟΡΩΜΑΙΟΥ Athena standing left, holding Nike on outstretched right hand and shield and spear in left hand; in upper right field, monogram; in lower left field, crescent and star; in exergue, [Θ]. Reverse: ΒΑΣΙΛΕΩΣ ΑΡΙΟΒΑΡΖΑΝΟΥ ΕΥΣΕΒΟΥΣ ΚΑΙ ΦΙΛΟΡΩΜΑΙΟΥ / Athena standing left, holding Nike, spear, and shield; star and crescent to left, monogram to right, IA (date) in exergue.